The age of the military shooter is over. The days of grey brown FPS with army sergeants barking orders down your throat have passed. We as a community have just gotten bored of the same old military formula, and thus the big shooter developers need to mix up their formulas a bit. 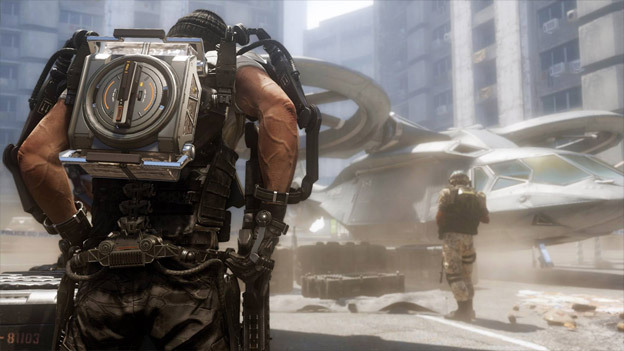 Battlefield has decided to ditch their military motif for a cops and robbers formula, while Call of Duty, arguably the biggest shooter franchise in existence, is going down the sci-fi future route with Call of Duty: Advanced Warfare. We got to see the game at E3 2014, and it certainly impressed us what a new studio with an extra year of development time could do to reinvigorate an old timey franchise that feels like it has used up all of its tricks. First of all, as is the case with many next-generation games, Call of Duty: Advanced Warfare is absolutely gorgeous, and the stage demo we saw was sure to point that out. We have made a flying leap over the uncanny valley here, and the degree of realism that these digital soldiers display is astounding. Heck, pupils dilate when looking at explosions, which is a shame because we all know that cool guys don’t look at explosions. Basically all the action, even the big cinematic points of Call of Duty: Advanced Warfare will be rendered inside the actual in-game engine, which is a huge achievement. The setting of Advanced Warfare is the “science future.” Basically, you won’t see lightsabers or eye lasers or faster than light travel here. Rather, the game is attempting to take a look at what warfare might look like in the very near future of 2054. Guns still fire conventional bullets and bombings are still a great way to knock out an enemy force, but everything has become much more computerized. Soldiers have access to mechanized exoskeletons that give them extra strength, remote robots that can fight without them there, magnetic gloves that allow them to scale walls, and active camo that allows them to blend into any of their surroundings. This may seem a little farfetched, but rest assured that each of these technologies is actually already developed and has been tested multiple times in real life. The gameplay still feels like Call of Duty. In the single player, your basic objective is to move to a location, have a cover based shootout with your enemies, move to another location, and every so often encounter some sort of awesome set piece. 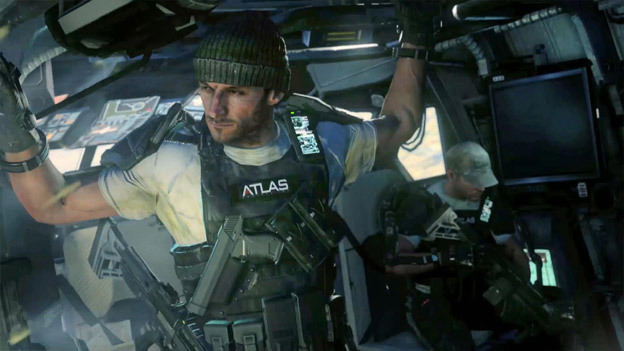 What Advanced Warfare does, however, is open up the world by giving you more options. If you don’t have cover, for example, you can set up your own remote cover shield. If you have issues getting to your checkpoint, climb a wall. Want to cause some real carnage? Hop on to a hovertank! 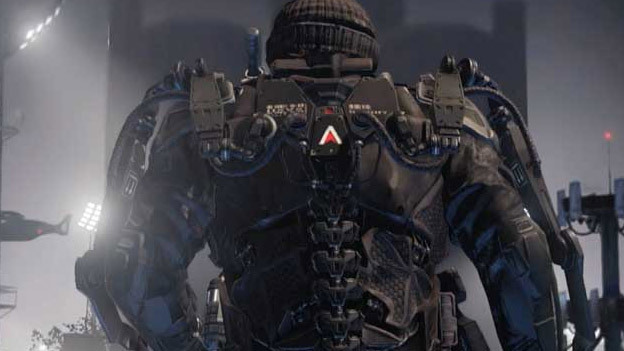 Everything in Advanced Warfare feels like it has been blown up from the original Call of Duty formula. Your mech suits let you double jump, so the game has become a lot more mobile. Your grenades are a lot smarter, heading straight toward a target, so you have to plan less while using them. There’s even the ability to mark your targets with a scanner that allows you to see your enemies behind cover. This way you don’t run out into an ambush. All of this was just shown in single-player but I hope it sticks around for multiplayer as it would change the game on a huge scale. 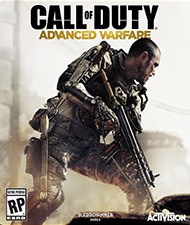 The one thing that I worry, is that the game will not appeal to old school Call of Duty fans because of its speed. Even though the same ADS (aim down sight) mechanics from the Call of Duty franchise survive intact, the game feels a lot more like an arcade style shooter than anything else. The ability to double jump gives the game a feeling almost like Titanfall. You can start firing a lot quicker from a sprint than you were able to in past Call of Duty’s as well. The slow cover based experience has certainly taken a backseat to using cool gadgets and getting straight into the heat of battle. That being said, I think that it’s OK that Sledgehammer decided to screw with the formula a bit. As I said in the beginning of this article, the age of the military shooter is over. Call of Duty: Advanced Warfare is trying something new instead of sitting on their hands and waiting for the formula to die. For that, I applaud them, and I can’t wait to see how the game evolves as we head closer and closer to its release date. Delivering a stunning performance the Academy Award winning actor Kevin Spacey stars as Jonathan Irons, one of the most powerful men in the world, shaping this chilling vision of the future of war.